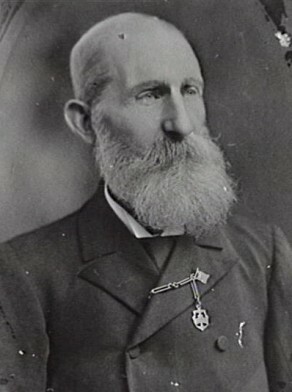 George Perry was born at Parramatta, NSW, in 1843, the son of Benjamin Perry and his wife née Combs, and was christened at St John’s Church of England at Parramatta. He died on 7 February 1912, aged 68, and was buried at Rookwood Anglican Cemetery, survived by his wife. George Perry was a Justice of the Peace and an ardent temperance advocate who spoke in the Sydney Domain for over 30 years. He was a concert promoter, lecturer and year round surfer almost until his death. He was probably the only Alderman to make a daily round of his ward to see that everything was satisfactory. George Perry was Alderman for Cook Ward, 7 December 1900 to 30 November 1902 and 1 December 1904 to 30 November 1909.